You’re finally ready to get your hands – or at least your trowel – dirty and lay your tiles. After consulting its label, carefully mix your mortar. You're "combing" the mortar right if you hear a grainy scrape. If you can see pinholes in the mortar, then you're not applying the mortar properly. 1. Use the flat edge of your trowel to apply mortar. 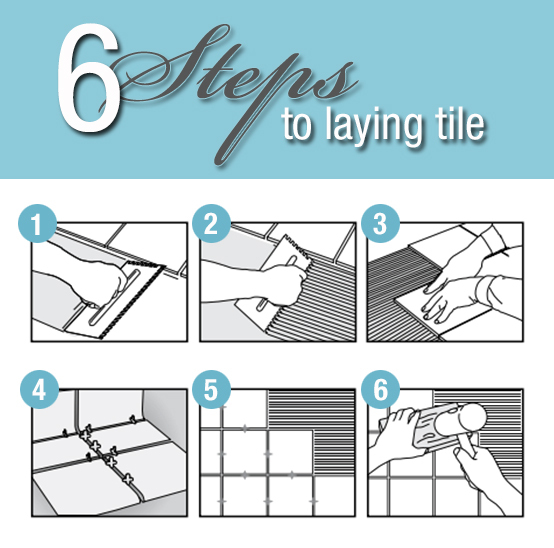 Install your floor according to the quarters you drew in chalk while laying out your tile design. So, plan to begin at the center point of the surface and move outward – covering one quarter at a time. Then, using the notched section of the trowel, go back and “comb” the floor mortar to form straight, even ridges. Don’t be afraid to apply pressure to your trowel! After the floor mortar has been laid and the floor tiles are installed, the next step on the path to a great floor tile installation is to grout the floor. Hi David! Your trowel notch is informed by your tile size. The larger the tile, the larger the notch. General guidelines for trowel/tile notch size are: 1/4” x 1/4” square notch trowel for 4” to 6” floor tile, 1/4” x 3/8” square notch trowel for 6” to 12" floor tile, 1/2” x 1/2” square or round notch trowel for 13” to 20” floor tile, and 3/4" x 3/4” round notch trowel for 20” or larger floor tile. Again, these are just guidelines to help achieve proper mortar coverage. Be sure to check during installation to make sure proper coverage is achieved. Feel free to reach out if you need further assistance. We're more than happy to help!